The 184 kW Golf R32 with its individual looks and standard all-wheel drive represents Volkswagens second venture into the segment of high-power compact and midrange vehicles; following on from the impressive but limited run of Golf Mark IV R32 which was launched in 2003. 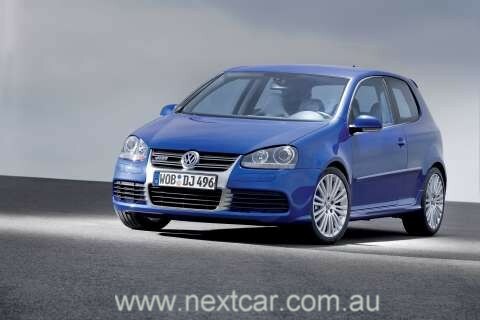 The new R32 is now available in Australia and Volkswagen has done it again with the pricing. The R32 is priced from just $54,990 (RRP)! This represents extraordinary value, particularly when the specifications and the performance are considered. One look at the current Golf range shows how Volkswagen is expanding the spectrum of dynamic performance hatches. Following on from the successful launch of the 147 kW 2.0 turbo Golf GTI in May 2005 and the 110 kW 1.8 turbo Polo GTI later in 2005, comes Volkswagen’s exquisite 6 cylinder all-wheel drive Golf R32. The agile 2.0 turbo engine in the Golf GTI and high-performance 3.2 V6 in the R32 play a major role in this dynamic positioning. While the attraction of the Golf GTI is its character as a purist icon of “the Hot Hatch” offering straightforward driving fun, the special appeal of the now 184 kW Golf R32 lies in the superior technical combination of six-cylinders, all-wheel drive and a striking appearance that only a Golf can offer in this segment. The heart of the new flagship Golf is a four-valve six-cylinder engine. Its sonorous sound is true to its excellent development. The engine powers the Golf forward with little resistance. Power to weight ratio: 6.12 kg/hp. Together all cylinders deliver 184 kW at 6,300 rpm. The 3,189 cm3 V6 produces its maximum torque of 320 Newton metres between 2,500 to 3,000 rpm. The performance of the new Golf R32 is therefore incredible. The manual five-seater with a top speed of 250 km/h catapults its passengers from 0 to 100 km/h in just 6.5 seconds. As standard, the engine output is transferred to all four wheels via a manual six-speed gearbox and 4MOTION. 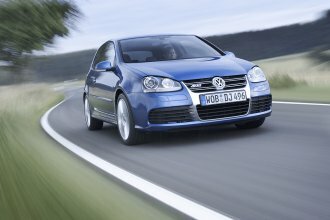 Volkswagen also offers the new Golf R32 with the DSG direct-shift dual-clutch gearbox as an option. This unique automatic shifts extremely fast and precisely. The DSG version of the Golf R32 can accelerate from 0 to 100 km/h three tenths of a second faster, i.e. in 6.2 seconds. The Golf R32 races to the 1,000 metre line in 26.7 seconds with both gearboxes - these figures make this Volkswagen a top-class sports car. In terms of design, the four-valve six-cylinder engine has a narrow V-angle of 15 degrees between the cylinder banks. The bore is 84.0 millimetres and the stroke 95.9 millimetres. Each of the four overhead camshafts - two per cylinder bank - use continuous timing adjustment. The adjustment angle is 52 degrees on the inlet side and 22 degrees on the outlet side. Roller rocker arms with hydraulic play compensation operate the valves. Each of the six cylinders is assigned its own ignition coil. The DSG automatic dual-clutch gearbox is optionally available for the Golf R32 as an alternative to the standard six-speed gearbox. The transverse mounted DSG combines the agility and economy of a conventional manual gearbox with the convenience of an automatic. You can also select gears manually using the paddles on the standard multifunction steering wheel or the selector lever. The DSG has six forward gears just like the manual gearbox. The Golf R32 with DSG consumes 9.8 litres of fuel every 100 kilometres on average. Equipped with the standard six-speed manual gearbox, this sports car consumes 10.8 litres per 100 kilometres. DSG is truly revolutionary in terms of automatic consumption figures. Incidentally, the fact that the DSG is used in Volkswagen Groups new Bugatti Veyron indicates the performance credentials of this superb technology. The new Golf R32 converts its power reserves into continuous forward movement by means of 4MOTION all-wheel drive. The advantage is that there are no traction problems in the wet and there is not even a hint of torque steer. The first 4MOTION system made its debut in 1998 as a follow-up to the syncro drive. Technically, the most important 4MOTION element is the latest generation of wet (oil bath) plate clutch. Compared with a purely mechanical Torsen differential, the Haldex coupling has the decisive advantage that it can be controlled electronically. It therefore works in perfect harmony with the Anti-lock Braking System (ABS), the Traction Control System (TCS), the Electronic Differential Lock (EDL) and the Electronic Stabilisation Programme (ESP) - all of these driver assistance systems are standard in the Golf R32. Thanks to the electronic control, it now reacts even faster, more precisely and quieter. In principle, all-wheel drive technology is particularly advantageous in the wet, on ice and snow and is superior to rear wheel drive in particular. But also on dry roads, 4MOTION improves the lateral guiding force and therefore the active safety. The dynamic safety chassis for the new Golf R32 provides an impressive synthesis between sportiness and comfort. The front wheels are mounted on a strut axle. A highly innovative multi-link layout is used at the rear. It made its debut in the current Golf. The multi-link rear axle is suitable for use with front-wheel and all-wheel drive. It can also be adapted for other models. The Golf R32 comes with 18-inch Zolder alloy wheels as standard. They reveal the blue-painted brake callipers and vented discs of the high-performance 17-inch braking system. The high-performance 225/40 tyres with directional tread pattern have the speed index rating Y and are therefore approved for speeds up to 300 km/h for safety. The centre of balance has been lowered as the total height has been reduced by 20 millimetres (thanks to the standard sports chassis set-up). The rear axle on the Golf R32 deserves particular attention: The modern multi-link rear axle for the all-wheel drive Golf R32 proves its full performance potential. It allows a rare combination of excellent handling and superior comfort characteristics in this class. The precise handling is characterised by impressive safety reserves and extraordinary agility. Thanks to the sophisticated four-link construction, the longitudinal and transverse forces acting on the rear wheels are absorbed specifically and independently of each other. This allows precise guidance of the wheel and thus clearly defined handling in all conditions. Front axle in detail: Numerous detailed modifications compared with the predecessor improve the performance characteristics of the proven strut front axle. The high transverse stiffness of the front wheel suspension ensures noticeable improvements in agility. Highly effective anti-roll bar connections reduce the body roll when cornering. The steering precision benefits from the more direct ratio of the electromechanical steering (EPS = Electrical Power Steering). Brakes in detail: A sophisticated sports car should brake just as well as it accelerates. The new Golf R32 certainly meets this requirement. Vented disc brakes with a generously dimensioned diameter of 345 millimetres at the front and 310 millimetres at the rear. The brake callipers are also a striking feature. For the R32, they have been painted blue instead of red as in the Golf GTI. In combination with the standard dual-brake assist, braking values are achieved, which do indeed meet the demand for braking performance on the same level as the acceleration. The R32 also comes with the ESP (Electronic Stabilisation Programme). Front design: The new model is distinguished greatly from the other derivatives in the series than the first Golf R32 was. If we take the front, for example, like the current Golf GTI, a completely individual radiator grille has also been developed for the Golf R32. 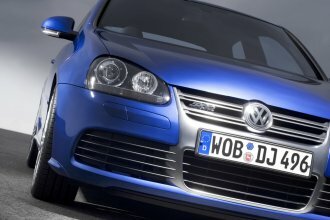 The design and aluminium look of the R32 grille also distinguish it from the GTI front. Particularly the lower part of the grille shows great modulation in the style of classic sports cars. Double aluminium-look bars in the upper section of the radiator form a further R32 styling element. At the side of the radiator grille, two additional large intakes complete the air supply. Furthermore, in contrast to all other Golfs, the lower third of the front bumper on the R32 is painted completely in the body colour and there is an airflow element on each side that sweeps along the side skirting to the rear bumper. Rear design: The rear bumper on the new Golf R32 is also completely painted in the body colour. Only the centre segment, styled like a diffuser, is black. The twin round polished stainless steel tail pipes have been integrated next to each other to make a striking feature. Silhouette: Looking at the Golf R32 from the side, the 18-inch alloy wheels (“Zolder” model) are striking. Featuring a total of 20 spokes, they are based on the design of the first R32 wheels. You can also see the blue-painted brake callipers through the spokes. At the front, these are combined with 345 millimetre discs and 310 millimetre discs at the rear. A prominent R32 logo replaces the Golf badge on the tailgate. 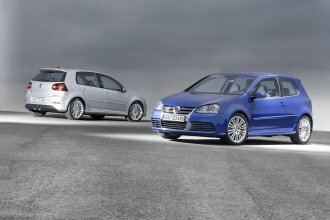 The R32 is available in four unique colours: Deep Blue Pearl Effect, United Grey Metallic, Reflex Silver Metallic, Black Magic Pearl Effect – all at no extra cost! R32 measurements:The dimensions of the Golf R32, which is available as a three-door and five-door, only differ slightly from the other versions. There are small changes, of course, due to the new front and rear design as well as the 20 millimetre lower sports chassis. Therefore we will use the basic Golf model as a comparison: While the Golf Trendline is 1,759 millimetres wide, 1,485 millimetres tall and 4,204 millimetres long, the Golf R32 is exactly 4,246 millimetres long (+ 42 mm) and 1,465 millimetres tall (- 20 mm). The width is the same as the Golf Trendline. The interior features numerous details that are only available in this smart sports star of the Golf series. They include the elegant ”Engine Spin” trim as well as a specially designed gearstick knob and a perforated-leather sports steering wheel with the R logo that has a great feel. This emblem is also located around the head restraints on the standard sports leather seats. Volkswagen offers the newly designed sports bucket seats as an option for this model. 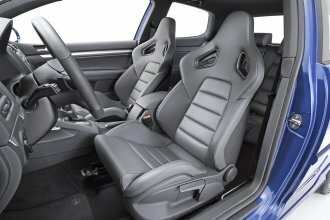 Thanks to their special contours, these seats, which were specially developed by Volkswagen together with Recaro, have even greater side support. They also bear an embossed R logo. The backrests on the folding bucket seats with broad shoulder areas and integrated head restraints can be adjusted on both sides of the seat. The back rest is unlocked using the belt guide. The bucket seats have a very sporty look, but are still practical. The cockpit pays tribute to the powerful temperament of the 184 kW Golf with a graphic adapted for the speedometer that goes up to 300 km/h. The characteristic R-banner logo also appears on the anti-slip rubber grips on the stainless steel-look pedal caps. In addition to the characteristic features for this top model, the new Golf R32 has everything you could desire in terms of standard equipment. This includes Bi-Xenon headlights, Climatronic (automatic air-conditioning system), the RCD 500 Plus radio system with ten speakers, the automatic dimming rear-view mirror with integrated rain sensor, the coming home/leaving home light functions, an anti-theft alarm system with interior monitoring and tow-away protection. Body-coloured bumpers, widened sill panels, bump strips, door handles and door mirrors underline the elegant sportiness of the body. A large, but smart rear spoiler makes the roof line look longer. It also improves the downforce on the rear axle and thus ensures more stable handling at higher speeds. The blue tinted heat-insulated glass reduces the build-up of heat in the interior when the car is in direct sunlight. The safety of this top performer is also increased by the extensive equipment. In addition to front and side airbags, the Golf R32 has a head airbag system for the front and rear passengers. Three-point automatic seat belts are provided on all five seats. The driver and front passenger are protected by belt tensioners and belt force limiters. 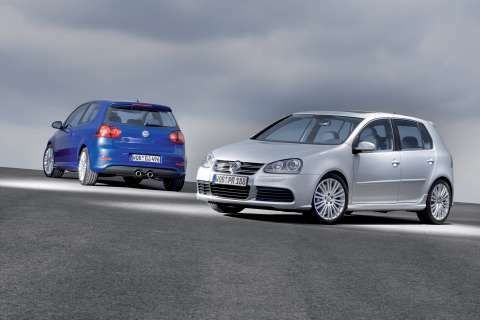 The Golf R32 also features the ESP (Electronic Stabilisation Programme), ABS and supplementary control systems. Volkswagen call it the “Beauty and the Beast”! That is a fair assessment, given our experience with this brilliant car in Germany last month. See our report here. 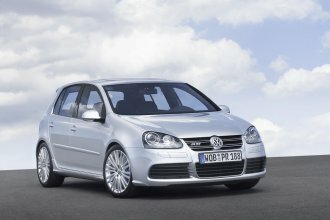 The new Golf R32 is priced from $54,990 (RRP) for the three-door manual and $56,490 (RRP) for the five-door manual. The DSG gearbox is an additional $2,300. This new model is now being delivered to Australian Volkswagen dealers.